Hi everyone! Martice Smith here! I’m so happy to meet you back here in the Artmosphere! Today, I’m showing you how to create a set of super fun, colorful and whimsical holiday cards. Now, don’t get me wrong, I do like the traditional red and green seasonal colors but whenever there’s an opportunity for me to create something during this time, I celebrate with allll the colors of the rainbow! Yayy! Another bonus? 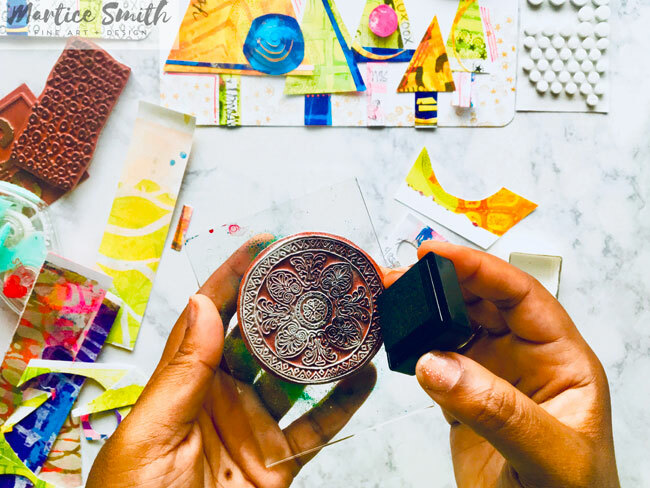 There’s no precision cutting required, this project is kid-friendly, and it’s a fun way to use up stacks of Gelli prints. 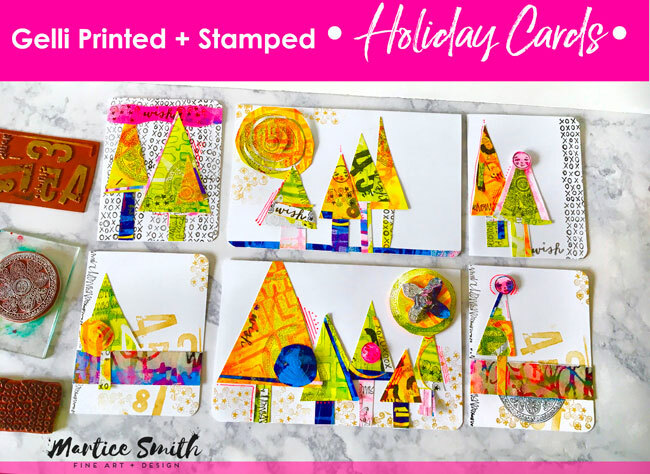 Feel more confident as you make your very own set of gelli printed, stamped and collaged holiday cards! The triangles will represent trees and the rectangles will represent tree trunks. I like to be a little “extra” sometimes and add my own twist to things! I cut the circles into spirals (yep, same as you may have done in kindergarten), just to give them a little oomph! TIP: Think about composition: if you’re working on a small a card, maybe two trees would feel more balanced than if you were to add four trees. No cramped compositions! There is no wrong way of doing this - just have fun, make bold color moves and enjoy the process of experimenting! To attach the pieces of paper to the card, I used double-sided sticky tape. Foam dots were used to create dimension. These little things are so much fun to play with! You can stack several layers of paper to create dimension. So clever, right?! 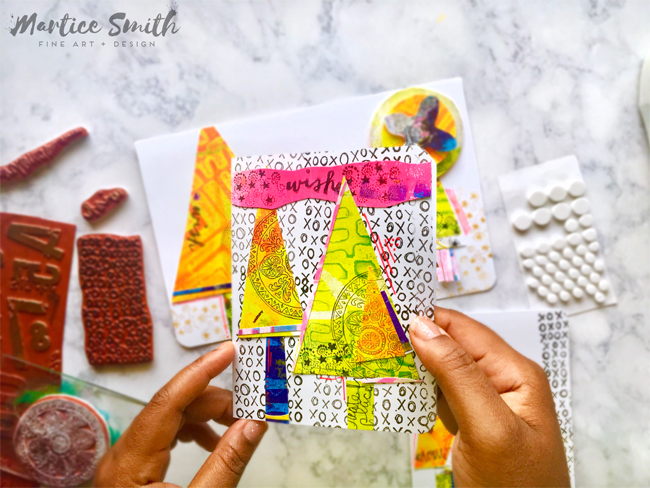 You don’t have to be precise when you decorate your cards but I wanted to give my cards a bit of visual interest by incorporating pops of neon paint. As you can see, these aren’t your typical holiday cards! Write your message on the inside and you’re done! Love them so much!! 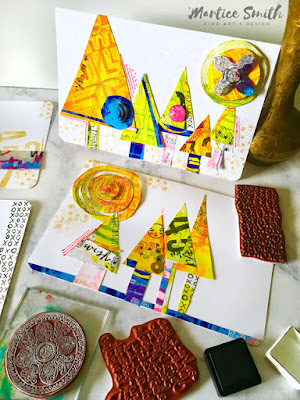 Thank you for sharing colorful, fun, inspiring creativity!